Before we get into it, a few props are in order. Kudos to NBC for not succumbing to the reality show siren's song, and instead loading its Sunday summer schedule with 13 episodes of this original drama. Kudos to the producers of Merlin for employing Anthony Head, the lovable bookworm Rupert Giles from Buffy The Vampire Slayer. And kudos for creating something magical powers-related that's not as offensively ridiculous as Heroes. But that's as far as I'm willing to go for what looks, feels, and is acted at the level of a Syfy Channel movie of the week—spread out over three months. This is the origin story of Merlin, the famed wizard of Camelot who guided King Arthur to glory and much chain mail. Merlin (played doe-eyed by relative newbie Colin Morgan) is sent to the mythical kingdom by his mother. He has natural magical abilities, rare since just about everyone else has to study hard at it. 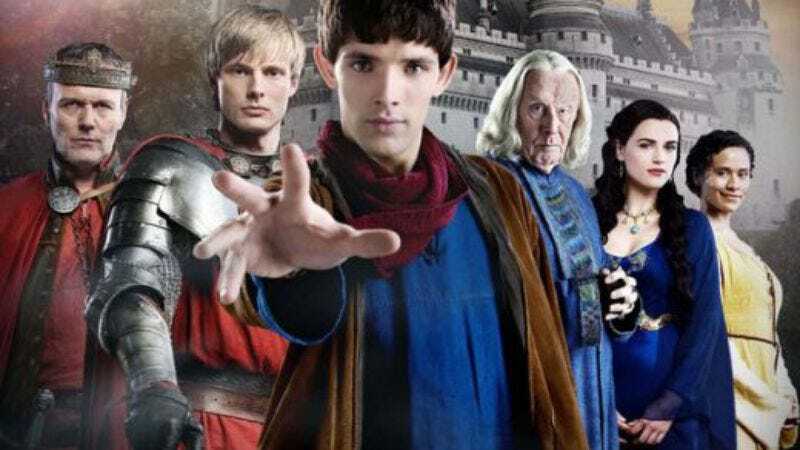 Problem is, Merlin can't tell anyone about his talents, since the use of magic in Camelot has been outlawed for 20 years by King Uther Pendragon, Arthur's father. In the first episode, a woman whose son is killed for practicing magic decides to take her revenge; calling upon her own magics, she takes the form of a world-renowned singer on her way to entertain the court, hoping to slip into the castle and stab Arthur. A nosy Merlin finds himself at the castle, realizes something's amiss, and saves the day—his reward is an order to serve as Arthur's personal servant, a boy he's been quibbling with in town. Infuriating, yes, but a mythical dragon, imprisoned in the castle's dungeon, tells Merlin it is his destiny (mentioning nothing of the epic beard he will soon wield). In the second episode, Merlin does it again; this time it's uncovering a knight with an enchanted snake shield. All the while, Merlin relies on his powers to save the day, but no one must know. It certainly doesn't help that the entire first hour of Merlin is spent getting the young wizard alongside Arthur, rather than cutting to the chase quicker. In fact, most of the scenes between Merlin and Gaius the doctor consist of doc walking in on Merlin using his powers to do mundane things—needless to say, it gets pretty old. Nor is there really any use of magical powers besides telekinesis, the lowest budget of all types of magic. The writing's certainly passable, but usually clunky ("If I can't use magic, I might as well die")—and same goes for the acting. Nothing stands out, nothing is horribly offensive, most is the very definition of mediocre. Translation: This is a Syfy movie, through and through. And if you're in the right mindset for an okay-enough TV watching experience (read: bored as all hell; hungover), this one's for you. But, on the other hand, there's a lot of great TV on DVD nowadays.